We're looking at the shutdown scams you need to avoid. (WXYZ) — The now month long shutdown has left thousands in our area strapped for cash. And with those workers vulnerable, experts say the latest shutdown threat may now be coming from the ringing of your cell phone. "When you’re looking for a paycheck of any kind you’re going to take what you can get," said Laura Blankenship of the BBB serving Eastern Michigan. But the BBB is strongly urging people to stay away from enticing offers on side jobs either coming via phone, or e-mail. In some cases, scammers will ask you to buy some gift cards and go in and do some secret shopping. They send you a check for the work but then ask that you to send a portion back. Once they do that, the check you received bounces and you've lost your money. 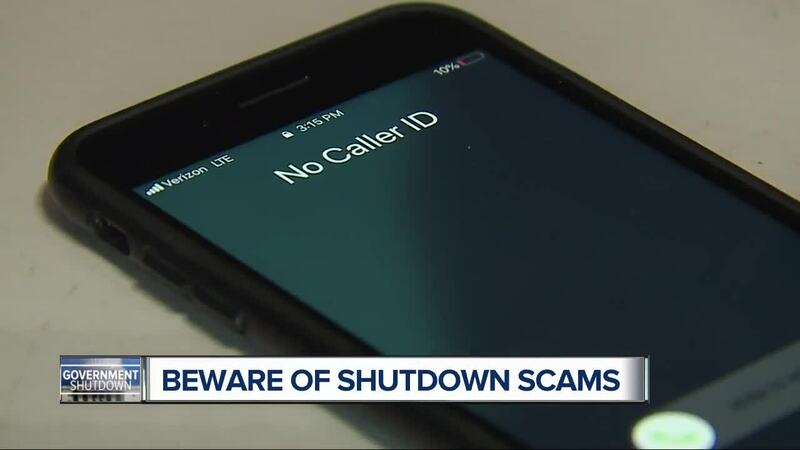 Another popular ploy at times like this are robocalls spoofing government agencies telling you your federal benefits will stop unless you give up some personal bank information. With many agencies not operating at full capacity, the claims are hard to verify, and scammers are taking advantage of the fact that you can't easily access the verification you need. Even if you’re not a federal worker, you can fall victim too, to fake donation pleas. 7 Action News did a quick search on crowd funding site, Go Fund Me and found over 3,000 posts from families who say they’re in need of help. The BBB says some of them could be fraudulent, An organizer might say he or she will route the donations to a family but may not, and instead keep the money, so you should always make sure you the money is going directly to the person it says its benefiting. Several federal agencies that normally field complaints are are closed due to the government shutdown. However, the BBB is not a federal organization. Anyone who's been scammed or targeted is urged to contact the BBB and file a complaint through its website BBB.org.